Wow. Because…well, I have been doing this for years. Even in middle school I can remember doing this: coping passages of books I liked, poems, and writing down other things I liked. Now, it actually has a name. I never called my collection of antedotes a ‘common place book.’ Matter of fact, I never called it anything, just my notebook. Inside this notebook I’d always hand write song lyrics, quotes, lists, general observations, notes, and attempts at poetry. It is not a journal/diary and I’ve never used it for that purpose–my journal is a separate thing altogether and kept in another notebook. I’ve always used moleskines for common placing because they’re inconspicuous (no one is looking over your shoulder while you’re writing in a small black book), sleek, and easily portable. The paper is high quality and doesn’t bleed through with gel pens, which is what I prefer to write with. Down below I will show you pics of my current common place book. However, I want to make some distinctions here between a common place book and a journal/diary, because in my opinion they are not one in the same. Journals generally consist of narrative entries, may be typed, and can be kept online. Common place books are not narrative, are usually handwritten, and are not kept online. Entries are not random, but rather, placed with premeditation. A nice pen and an attempt at neat handwriting may be used, because chances are the writer will want to come back to it later. Common place books are not scrapbooks, which are usually made and created for an audience. A common place book is only for the reader, and the items inside put there for specific interest and use for the reader alone. Some notes I was taking on sci-fi genres. A list of animal collective nouns. Why did I write this? I’m not sure. In this case, whole quotes copied out of a novel I was reading. This was Ethan Hawke’s “Ash Wednesday.” A very good book, btw. A list of albums I like for a music Tumblr I was thinking of doing. It never came to fruition. Some Radiohead lyrics I was too lazy to write, so I printed them out, cut and pasted them. Yup. I didn’t win this year. Even though I am slightly crushed, I think I am ok with this. My intentions were good. I planned for several weeks before–my plot, my characters. I started on midnight November 1st and went about writing MY novel. And it worked at first. Despite my work schedule, motherly duties, the general business of running my household I set aside time for my endeavor. Words flew from my fingers. I was killing it. I wrote with wild abandon up to the second week, and then something happened. I began to lose steam. Entering word counts, following schedules, typing X amount of words per day. It began to feel more like a chore than an enjoyable experience. So I stopped recording the word count and stressing about the looming date of November 30. I am still writing. My novel isn’t dead. But it won’t be finished within the span of 30 days. While I applaud NaNoWriMo’s efforts in just getting people’s off their asses and writing, their 30 day window cannot contain me. My novel will be finished when I need to finish it. It may or may not have 50,000 words, but it’s cool. It may not make sense either, but that’s ok too. I am writing, and that’s what’s important. For me, the importance of music in my writing experiences can’t be stated enough. When I am sketching a character, my first question is often not what they look like, their age, or even what their name is. My first question, is usually “What would this character be listening to?” From there I get a mental picture (appearance, mannerisms, etc) and slowly begin to bring it into focus. With a character that listens to Miles Davis I may picture a sophisticated, artsy, urbane, hipster-kinda character. If they listen to Nine Inch Nails I may get an elusive, eccentric rebel. It all depends, essentially, on the power of a playlist. Music helps me shape the plots of my stories as well. I can’t tell you how many nights I’ve sat down to write and that song I’ve heard a million times will play on my iPad and I hear a certain line and think: THAT’S IT. I write it down and begin my planning from there. I will write that lyric down and use it to guide my plot. It’s like a movie playlist. A short story that I wrote recently began with a line from REM’s “Everybody Hurts.” Which is a great opener, by the way, because it leads me into questions that will be answered throughout the narrative. For example, why is this character hurting? Why do they feel everyone else is hurting along with them? And what experiences have they undergone in their life to have such a feeling? Posted on November 2, 2014 November 2, 2014 Categories WritingTags inspiration, music, writingLeave a comment on The muse. 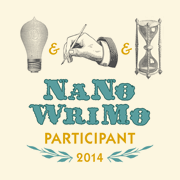 Posted on October 31, 2014 October 31, 2014 Categories WritingTags NaNoWriMo, writingLeave a comment on NaNoWriMo is here!